With the increased focus to implement LNG liquefaction facilities globally, and an increasing number of new projects coming online in the next five years, a new generation of first time operations teams will be responsible for the management of multi-million dollar facilities. Each of these facilities, regardless of their location, will face the same problem of having adequately trained operators. From initial start-up to full training capacity, new operations teams will be required to bring up various sizes and types of plants safely. To make this process successful, many will be using operator training simulation (OTS) systems in preparation for start-up and will use these throughout the lifecycle of the facility to sustain optimal control and uptime of the LNG or terminal assets. People learn more by seeing how something works rather than just reading about it. If interaction is added to a visual interface, improved results occur in almost every training scenario. 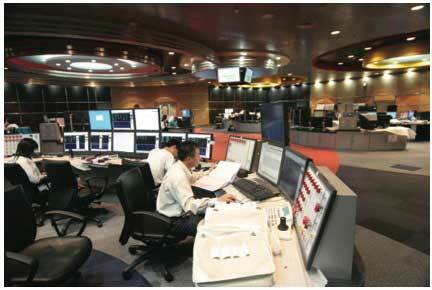 As such, process plant operator training through simulation is practiced throughout the industry. Operator training is vital for a number of reasons. First and foremost is safety: training helps to reduce incidents and accidents. Training also improves process control, resulting in higher throughput and consistent quality with less downtime. Well trained operators can also have an impact on reducing maintenance by operating equipment closer to its original design specification. As most of the projects are implemented on the coastline or offshore, compliance with regulations may also require some form of operator training in many instances. In general, the higher the potential environmental and safety impact, the more oversight involved from regulatory agencies. In addition to direct operational costs, operator errors and subsequent incidences can result in fines, restricted operations or loss of capacity. These occurrences can be minimised or eliminated with the right training plan and equipment, of which offline process simulation represents a key component. Moreover, if an accident does occur, training programmes and related records can be a mitigating factor to show that the plant took precautions and performed due diligence. For the reasons outlined above, it is apparent that all process plants need to train their operators, and most companies use some combination of three basic training methods. The first is training by working alongside more experienced personnel. The second method is the study of written materials, and the third is training through simulation. To understand the value of operator training through simulation, it is necessary to think about the operators' responsibilities during the first few days of start-up. There are a multitude of activities taking place for the first time with a live process. Operators report to the control room where they are promptly overwhelmed by a crowd of engineering support and contractors; even with a veteran operator providing guidance it would still be a challenging task. One should also consider the time it takes for an operator to understand what is really happening in the facility, and how this learning experience could be accelerated to meet current requirements. 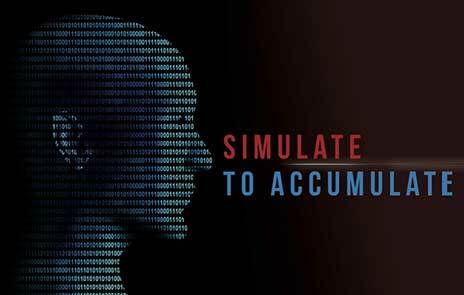 Simulation is one way, and it is a lower-cost option in today's environment. When process simulators were first introduced in the early days of the Distributed Control System (DCS), a great deal of software engineering was required just to get the simulator's screens to emulate the ones the operators were using. Much more time was required to simulate the process itself, as well as a very high level of process knowledge. Simulator programming previously had to be done with sophisticated computers, so it took a combination of cooperative personnel with special skill sets to program and maintain the simulator. With the exception of nuclear power plants and refineries, where simulation capability was absolutely critical to prevent incidents, very few industries could afford the cost. Fast forward to the present, to the ubiquitous and inexpensive PC. The PC's introduction into the process control industry made simulation an affordable option, as costs decreased and options multiplied. The PC hardware itself is inexpensive, and graphical programming methods created for the Windows operating system now allow simulator programming and configuration by plant personnel instead of by IT experts. Figure 1. Process flow diagram screen example. With the advent of the PC, simulation is now affordable, and available in three basic types. 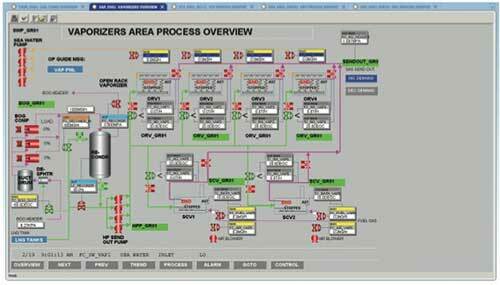 First is the basic process simulator that is generally part of the engineering configuration software supplied with the control system, particularly with a higher-end process plant DCS. This basic process simulator enables software loop tiebacks in which the output of a loop is taken back into the input through software in a virtual environment. This creates basic loop responses that give operators a fundamental feel for loop control, screen navigation and basic responses. Simulating more sophisticated loops is not feasible with this type of software. The next level of simulation uses two PCs, one running the control software program, and the second supplying process simulation responses, with the two PCs typically communicating via Ethernet. This type of simulation can also be done in 'the cloud', allowing operators to be trained wherever a PC is available. At this point, sophisticated and realistic process dynamics can become an integral part of the simulation. Sizing of vessels, stroking times of a valve and dynamics of the process can be entered and adjusted. Because the properties of the process unit in the simulator PC can be changed, it is now possible to integrate process noise and make the simulation more realistic. This type of simulation is not meant to replicate exact plant processes, but it can be modified on a tag-by-tag basis to yield required response levels, and this level of simulation can be expanded to cover the entire operation if necessary. Perched at the top of the process simulation hierarchy is the high fidelity simulator. This type of simulation can precisely replicate the process dynamics for every piece of equipment in the plant. If operator training simulation must precisely mimic the actions of a process train or terminal, this is the route to take. Several types of industries require this level of simulation, and many others could benefit. The terms low fidelity, medium fidelity and high fidelity, are often used to define the three levels of simulation. These terms loosely describe how close the simulated plant's process and equipment responses are to the actual plant. In reality, there are a lot of grey areas where the functionalities of one level can cross over into another. Before simulation can be incorporated into operator training, the training programme itself should be examined. Operator training should revolve around certification and benchmarking. Certification verifies that specific skill sets have been met, and benchmarking creates the best practices. Capability and knowledge assessments must take place to ensure that each operator is at the correct level. The process simulator can help to create scenarios that depict actual train operation problems. Common and unique events can be recreated and used to record the operator's response. Responses of the best operators can be used to establish the best practices, and should be used for comparison by less experienced personnel. Once the best practices are established, the training system can be used to measure improvement. To build for success, training scenarios should be created in which instruction is self-paced and easily understandable. Exercises should be broken into smaller digestible pieces that build on each other. Normal operating procedures for process start-up, shut-down, loading or unloading, are good starting points for training. A process simulator can be set up to quickly move to different process operating conditions. One operator could practice training start-up and operation, but the next one must work on ship loading. These simulations can be executed by taking snapshots of the process running in specific conditions. One can then simply implement the process snapshot to fit the required training. Simulators can also be sped up or slowed down. For a process with a large amount of dead time, the simulator can be sped up to compensate for the delay. For training of inexperienced operators, actual process conditions can be slowed to build confidence, and then gradually sped up as experience is gained. Taking training a step further, observation of operator actions can be used to better the actual process control programmes and the Human Machine Interface screen designs. This can further enhance operator actions, reducing the possibility of incidences and improving general plant operation. Figure 2. Operator control room. The simulator can be made more accessible and user friendly, helping to break the old-school conception of an OTS. This is where using 'the cloud' comes into play. An OTS can be run in a global server, which gives employees access from any PC. Procedures pop up on the operation window to guide the user through the start-up, shut-down or train change, in a safe manner. Every user has a unique login and password; passwords can be as strong as one wants to ensure OTS security. Training is now self-paced and accessible 24/7; it can be stopped and started at any point. The user can return to where they left off in the OTS, so there is no unnecessary repeating of training units. An instructor can be added later to trigger process events, or one can have pre-defined events automatically triggered. Student response tracking data is reported back to the learning management system without any additional personnel required. Every expenditure has an associated cost/benefit ratio, and operator training simulation is no different. LNG facility management personnel must decide how closely the simulator needs to mimic the exact operation of the process as this is the primary cost driver. The closer the simulation to the actual response of the gas treatment, acid gas removal and in-tank pressure control, the higher the cost, but the greater the potential benefit. Once the right level of operator training simulation is selected and implemented, a common point of failure is a lack of ownership or assigned responsibility. Every process undergoes constant changes, as do most simulation software packages, and someone has to own and implement these changes. If the operator training simulation does not have a champion, it will fall out of use, and the last thing any plant wants is an investment gathering dust. Horror stories abound about plants spending large amounts of money on a process simulator that becomes redundant. That is not a failure of operator training simulation, but rather a failure of plant training and operating procedures. The military and the airline industries have been using simulators for decades. They understand the value of experiencing situations in a virtual environment before being plunged into reality. The goal is to get the trainee as close to the real world as possible. This is accomplished by training individuals so that if and when they experience a worst case scenario in real life, they have already implemented the solution via simulation. This gears trainees for success. Experienced operators are retiring or just do not exist for the new liquefaction plants being implemented, and new personnel have to be brought up to speed quickly. Fewer experienced operators mean fewer opportunities to spread industry and process knowledge than in the past. This can lead to unscheduled shutdowns, costing millions of dollars. Shutdowns can also bring fines, plus unwanted government and media attention. To improve this situation, a solution is an on-going operator training simulation program that challenges operators, both new and experienced. The results will speak for themselves as a process simulator allows competencies to be established in months, not years. A smoother running process translates into a more profitable plant, yielding a quick payback on the simulation system investment. No plant can risk training operators on actual equipment, but a good plant simulator will have the look and feel of the actual process, enabling the training of new and experienced operators without jeopardising actual operations. The closer to the look and feel of the actual process, the more prepared operators will be when monitoring, controlling and performing that process. Often overlooked are the morale dividends created by investing in employee training. The time and expense involved with training on a process simulator is not lost on the plant employees as they know it is an investment in their future, as well as the future of the facility where they work.